Akroma’s legacy is no more and no less than every single keyword ability she has, and as such, it reads very excitingly. Of course, mana-wise, you’re spending almost as much as Akroma herself costs, but not getting an actual creature. When you’re using the Memorial, you’re more likely to be looking at what sorts of creatures become more dangerous with one or more of its keywords. Creatures with the infect keyword are much better when you give them flying or protection from a lot of removal spells; creatures with deathtouch or saboteur abilities are much more dangerous with trample, and a lot of larger creatures look a lot scarier with haste. The strangest application I’ve seen for the Memorial, though, was seeing it get a run in past iterations of artifact-heavy Vintage decks. It looks a lot cheaper when you have access to things like Mishra’s Workshop or Metalworker, and you can also use Karn, Silver Golem’s ability to make it attack just as effectively as Akroma herself. There might not be any mention of Akroma in Dominaria but that’s not going to stop us talking about her. 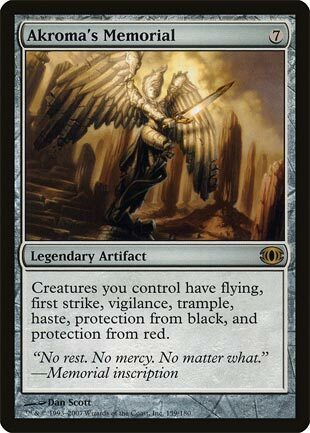 Akroma was the legendary angel before Avacyn. Infamous for her wall of abilities, she is one of the few mono white creatures to get Trample and the only one to get Haste. Now all those goodies can be shared and you don’t even need to run white. Akroma’s Memorial can be devastating in the right deck, especially if it runs green. The biggest problem with this card is that 7 mana. Sure it is the right amount to pay for such a strong ability but the cost is hefty. This card card can’t be splashed into any deck, but with the right tools to cheat it into play, such as green mana ramp, it can turn the tides of battle to your favor. That’s one long list of abilities. Looks familiar, right? That’s because it’s the exact list of keyword abilities on Akroma, Angel of Wrath. This time, you need to supply your own creatures, as it’s merely a seven-mana artifact without anything to do on its own. But making your entire board threatening in the unique way Akroma is makes it usually worth the investment…in Commander or casual formats, of course. If you’re going to spend a lot of mana on an artifact in Constructed, Akroma’s Memorial should not be it; an artifact with the ability to end the game on the spot, like Blightsteel Colossus, is a “safer” bet than this “win more” card. As an aside, the flavor text is the same as the original Legions printing of Akroma, which is a nice touch.